- It is not the result I was hoping for towards end of the year, but on the other hand it is underlines fact of not to be excited about share prices movements in real time. Even with the humble portfolio of 300 K movement of 3% will get you either 9K gain or loss. The focus is on the dividends returns, rather than anything else. At least the dividends are still good :) 4.5% is a pretty good yield. I'm sure precious metals are nearing a bottom. I don't see gold dropping to below $1,000/oz and it's around $1,200 today so the downside risk is limited. Some contrarians believe the RUB will appreciate against the USD over time. Is that why you hold it, or because you live in Russia and need spending money? Thank you for stopping by. 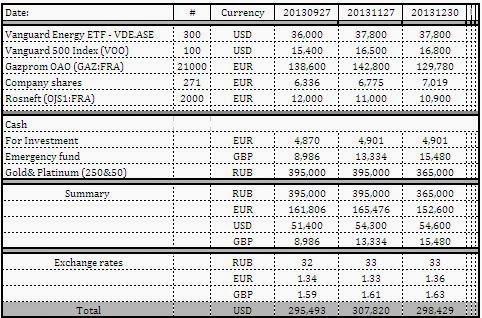 I keep about 3% of the portfolio in RUB just for the diversity sake, the same as I do for EUR and GBP. 5 years ago I would be pulling hair if I recorded loss of $ 18 K in one month, but I haven't as for the next 20 years the focus is on the returns. Hopefully one day I will achieve financial independence and could just keep my portfolio and live of the proceeds.